This article first appeared in The Prisma newspaper. In a collection of short stories, Peruvian writer Gunter Silva brings together the experiences of Latin American immigrants through the characters depicted in his tales, set in the British capital. 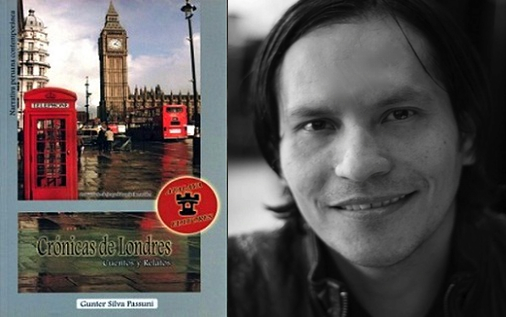 Originally from Peru but having lived in London for eight years, Gunter Silva Passuni is a young author who has recently published a collection of short stories set in London. The protagonists are Latin American immigrants experiencing the kind of problems their migrant status can present. Crónicas de Londres (London Chronicles) expresses every emotion, from homesickness and neurosis to anxiety, fear and love. It is a work that shows how immigrants struggle to survive in the big city. Silva maintains that he is not trying to send a message because “literary works are open to interpretation”, and that he wanted to show how immigration is a phenomenon that always has an effect on an individual, whatever form this might take. The art of storytelling and writing doesn’t bring in enough money to be a writer. It only brings satisfaction. Storytelling is something intrinsic to humans. In fact, we are always using the verb “to tell”. We don’t say “inform me about something” but “tell me”, and I’ve always loved telling people my observations about the world. And why tell these tales through the medium of the short story? I’m very impatient and writing a novel can take up to three years. I don’t have enough patience to wait that long. Short stories aren’t easier to write just because they’re short, but you do get to have the satisfaction of reaching the finish line. In a month and a half you can have a short story written and edited. When did you start to write short stories? I’ve always written short stories. There are some I wrote when I was young which are free to look at online. But they were very Borgesian, because I really admired Borges. They were completely part of the fantasy fiction genre. Nothing like Crónicas de Londres then? It’s completely different. I opted for something a lot simpler, yet no less profound, in the hope that the people who read it would be able to understand it. I wanted to write a collection of stories that a 16-year-old kid and an adult of 40 could both read, something accessible to everyone. How do you portray your characters? When you write you’re not thinking about what messages you want to send out. If I wanted to send a message I would write fables with morals, like Aesop. But one of the realities I depict is the problem of language. I see it as a bargaining chip, an asset. The people who fare the worst in my stories are the ones who don’t speak English fluently. The badly paid Latin American immigrants are those who can’t speak English well. Fear, failure, anxiety… These are some of the emotions experienced by your characters. Absolutely. Longing, neuroses… In one story, “Homesick”, I say that cleaning is the profession of the Latin Americans. They are forced to do difficult and badly paid work. When I arrived in London, Latin American students could work 30-hours while studying. This has gone down to 10 or 20 hours. They have to get together huge sums of money just to pay the rent and buy food. Are these true stories or the fruits of your imagination? All my stories are made up, except one which happened to me personally in Paris. But all the rest are my own inventions, although it’s true that when you invent you translate your own experiences. Despite the fact we’re living in the 21st Century, there is still racism and rejection of people who aren’t the same colour as you or of the same social class, and I wanted to reflect that in some of my stories. In fact, the idea for one of them came from a story a friend told me about when she went out for an ice cream with her African boyfriend and the children in the park threw oranges at the two of them, while the children’s mothers did nothing to stop it. Is British society like that? What I see is segregation. It’s the conservative people and the powerful who fear this Tower of Babel which is London. It’s a shame that there is this fear of other cultures in a city where people of so many different races coexist. “In London no one stops to lend a hand” is a phrase from one of your stories. Big cities are like that. They’re tough. And it’s only natural that this stirs up homesickness among immigrants because of the culture shock. Immigration always affects the individual. You end up asking yourself: Who am I? Am I Peruvian? Am I English? Cities like London can be very tough if you don’t have a good job, if you don’t know the right people and especially, if you’re an immigrant who doesn’t speak the language well. Are your stories meant for immigrants or British people? They’re meant for whoever wants to read them. All literary works are open to interpretation and meant for whoever shows an interest in them. I wasn’t thinking about who would want to read my stories while I was writing them. What can we expect from this book? Immigrant experiences, love, indifference, nostalgia, love for one’s country, failure… The book is made up of many different stories, and thus completely different characters in different situations. Every work of fiction is subjective. A lot of people will like it and many others will hate it, but it will always evoke emotions. What I hope to do is to transmit emotions and images to the reader through my words.